Welcome to Harp Column Podcasts, where we go behind the stories in Harp Column with your host Kristina Finch. In this episode, Kristina chats with Russian harpist Sasha Boldachev, featured in Harp Column’s March-April 2017 issue. Sasha talks about his winter 2018 U.S. tour and what else he’s up to lately. 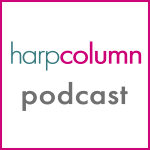 For more practical harp news and information visit www.harpcolumn.com, and tune in for more podcasts taking you behind the stories in Harp Column.